I have this slab pull problem. It started when my brother (a geoscientist) alerted me to the latest tectonic trend. It seems those inclined to mathematically model the lithosphere are unable to find an equation to express the spreading at the midocean ridges. Their equations provide uplift but not enough spreading. These people need to get out more. If they had ever split a log with a wedge they would understand. Rather than seek an equation to express what was obviously happening, they developed the concept of slab pull. Apparently there were some equations lying around for this. 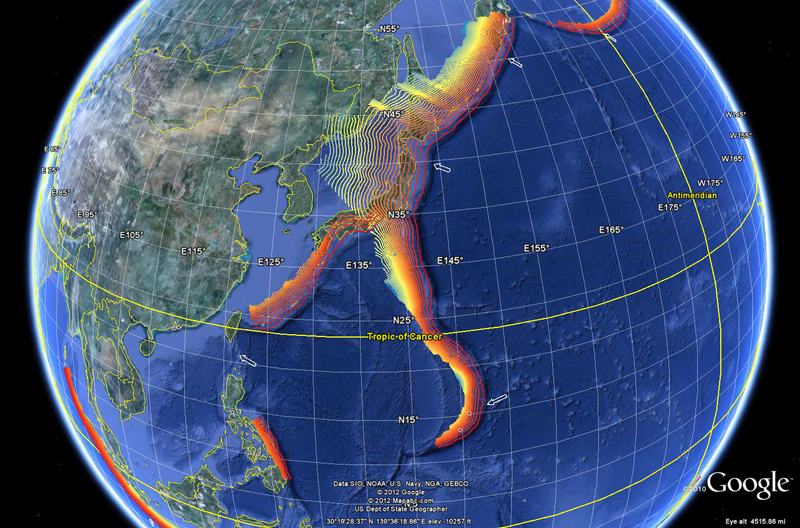 There is a great Google Earth plugin that shows the Benioff zones where earthquakes indicate the inclination plane of the descending slab at subduction zones. There is a lot of variation in inclination. Some are actually inclined at the 45 degrees shown in nearly every textbook subduction section. Others, notably under South America, Japan, and the system north of New Zealand are far less inclined. As ice is the solid form of water, the ocean floor is the solid form of the mantle. The solid forms of both are lighter than the liquid. The ocean floor has boiled up and condensed to a solid at the midocean ridges and the solid form wedged outward by further upwelling. All of this push and nowhere to go so eventually a colder, thicker, and heavier ocean floor far from the ridge is forced under a warmer, thinner, and lighter ocean floor from an opposing and closer ridge. Down it goes, probably at incredibly small angles when the crust was young, but eventually reaching a depth where it was remelted. Now some magic of chemistry and ocean crust is fractionated (cracked) and the lighter components (think aluminum) rise to the surface as volcanoes and eventually continents are formed in a process analogous to distillation. Continents are granite rafts. Continents can now deflect ocean floor to down as well. Both continents and the ocean crust ride around on the asthenosphere, a layer warm enough to be soft and plastic. I like to think of the asthenosphere as mud. Stuff will move on top of it and you can poke stuff down into it. Say you take a piece of carpet and lay it in the mud and step on one side. You find right away that it does not want to go down at 45 degrees. It will go straight down if you stomp it but to even get it to incline at 45 you have to carefully tamp it. The slab pull folks imagine that the weight of the submerged carpet will keep pulling it down. I don’t think so. Come back in a decade ant it’s still where you left it. Even a mud creature pulling would have to align with the descending plane to maintain the angle, but in reality instead of a mud creature pulling the end of the slab is melting. And then there is the problem of rifting. Where are the trenches currently pulling Africa and the Red sea apart? The trench systems bounding the Americas and East Asia are the wrong sign to have pulled Pangaea apart and opened the Atlantic. They would have pushed Pangaea together instead. Rocks have enormous compressive strength and very little tensile strength. You can push them all day long, but pull them and they break, especially around a corner. Math is wonderful when it works, but you don’t bend reality to fit the math. This habit has led to the popular expression , “having one’s head up one’s maths”. This entry was posted in Geography, Geology, Having one's head up one's maths, Oceanography, Paleogeography and tagged Formation of Continents, Oceanic crust, Pangaea, slab pull, Subduction. Bookmark the permalink.